It's Monday again; doesn't the weekend go by so fast?! And as usual it's time for another CAS (clean & simple) splitcoast challenge. This week's CAS challenge is a sketch challenge based on Alanna's card shown here. I also made this card for today's Try a New Technique challenge on splitcoast. Today's challenge was to find ways to use pierce our card. The piercing on my card is on my background. I made a few score lines using my scor-pal and in-between a few of the lines I did some paper piercing. I colored my flower stamp using my SU markers and then I stamped it onto my card stock. Next I punched out the images and layered them onto my punched Certainly Celery layer. I made a card similar to this a few weeks ago and I had this card in mind when I made my card today. I'm sorry that my picture isn't very good; I had a hard time getting a nice photo this morning. Have a great rest of the day! Thanks for stopping by! Patty, this is really pretty. I like how you did that paper piercing. Great card. The scoring/piercing is a lovely background for your pretty framed flowers. 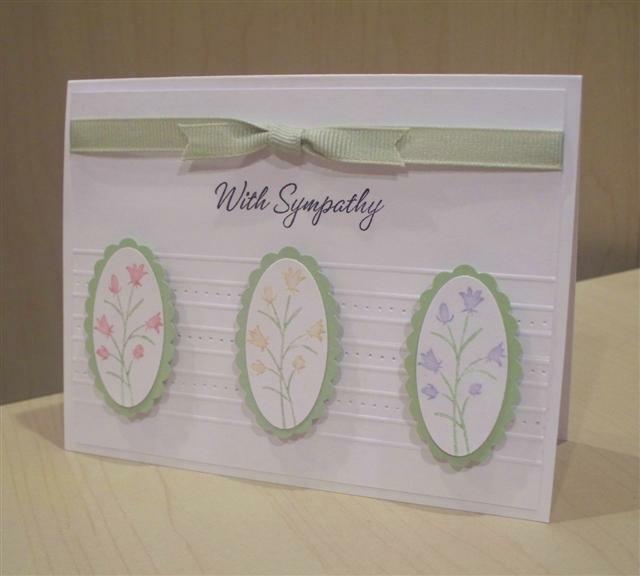 PRETTY PRETTY PRETTY - With sympathy cards are always SOOOO hard to make, you did it justice. The simplicity of this card speaks volumes...great job on this!! Very pretty, I like how you have the images layered over the scored lines.